For the rest of the story, see Cottonmouth moccasin v Yellow Dog and Brown Dog @ OPF 2016-11-29. 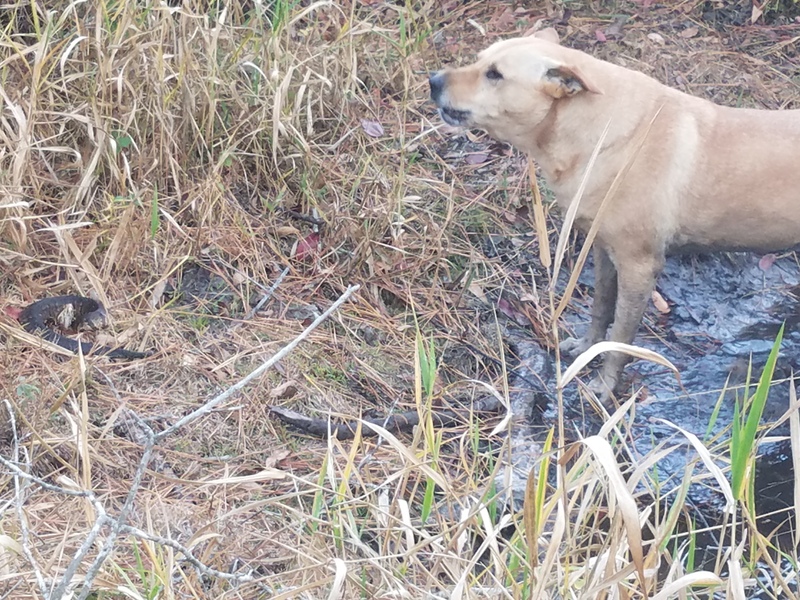 This entry was posted in Cottonmouth, Dogs, Reptiles, Snakes and tagged Agkistrodon piscivorus, Beaver, Brown Dog, cottonmouth, Dogs, Georgia, Gretchen Quarterman, John S. Quarterman, Lowndes County, Okra Paradise Farms, pond, reptile, snake, Yellow Dog on November 29, 2016 by John S. Quarterman. 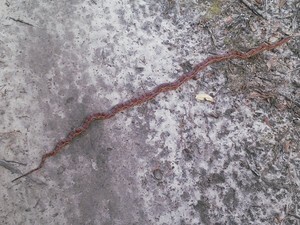 Rachael Thompson trained this snake. 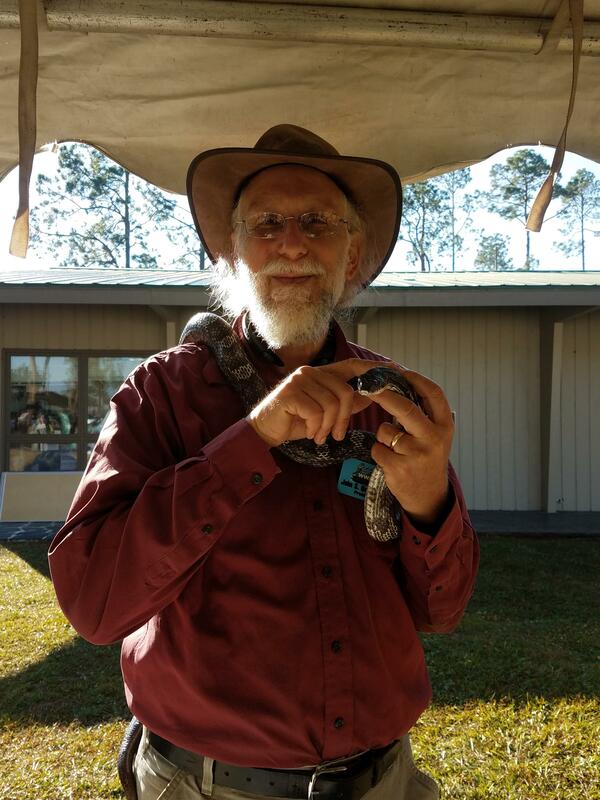 This entry was posted in Reptiles, Snakes and tagged Houdini, rat snake on November 19, 2016 by John S. Quarterman. 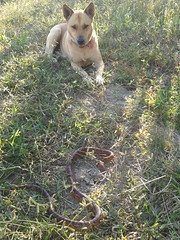 Gretchen Quarterman was surprised when Yellow Dog walked past me and picked up that snake about 4 feet to my left. I had backed off when I took this picture, but the venom splatter still got on my arm, which immediately started tingling. With a bit of soap and water, it’s fine. 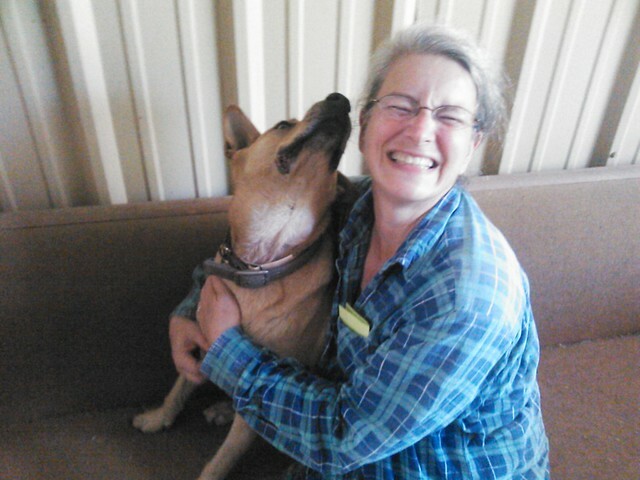 For once the Yellow Dog did not get bit. She did get some of the food she likes best and a bone. 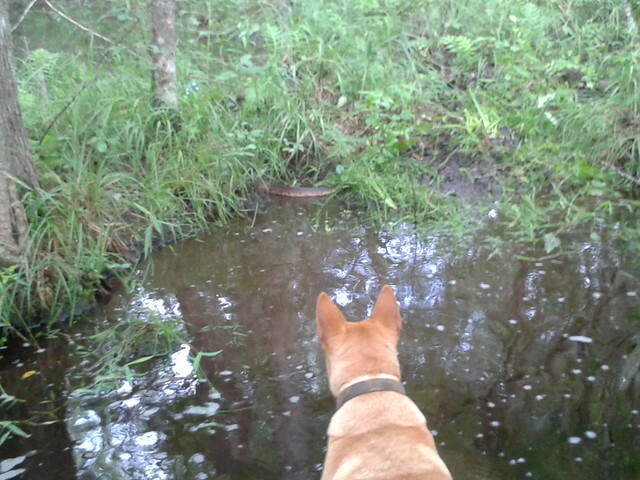 Brown Dog prudently stayed out of this one. 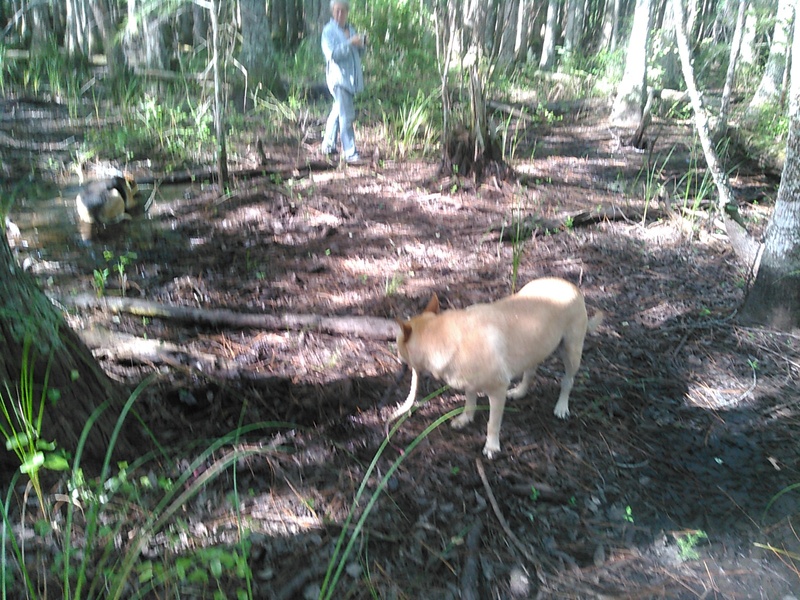 This entry was posted in Cottonmouth, Cypress swamp, Dogs, Okra Paradise Farms, Reptiles, Snakes and tagged Agkistrodon piscivorus, Brown Dog, cottonmouth, cypress swamp, Gretchen Quarterman, John S. Quarterman, moccasin, moccassin, Yellow Dog on June 20, 2016 by John S. Quarterman. 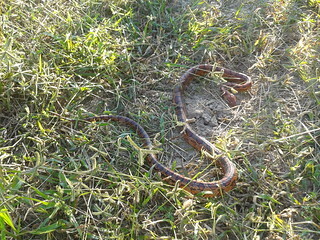 Fortunately Yellow Dog and Brown Dog weren’t around when I stopped the tractor to wait for this corn snake to slither across. This entry was posted in Corn, Okra Paradise Farms, Reptiles, Snakes and tagged Brown Dog, corn, corn snake, Georgia, Gretchen Quarterman, John S. Quarterman, Lowndes County, Okra Paradise Farms, Reptiles, Snakes, Yellow Dog on April 15, 2014 by John S. Quarterman. This entry was posted in Cottonmouth, Dogs, Okra Paradise Farms, Reptiles, Snakes and tagged 2 August 2013, Agkistrodon piscivorus, cottonmouth, Dogs, Georgia, Gretchen Quarterman, John S. Quarterman, Lowndes County, moccasin, Okra Paradise Farms, Reptiles, Snakes, Yellow Dog on September 1, 2013 by John S. Quarterman. This entry was posted in Cottonmouth, Okra Paradise Farms, Reptiles, Snakes and tagged 6 July 2013, Agkistrodon piscivorus, Brown Dog, cottonmouth, Georgia, Gretchen Quarterman, John S. Quarterman, Lowndes County, moccasin, Okra Paradise Farms, pit viper, pond, Reptiles, Snakes, trespassers, venomous, water snake, Yellow Dog on July 29, 2013 by John S. Quarterman. 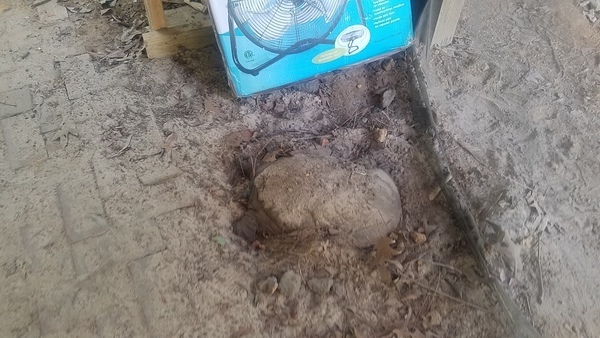 Like other softshells, the Florida softshell turtle (Apalone ferox) is a large, flat turtle with skin covering its shell (resembling a pancake). It is the bulkiest of the softshell turtles but inhabits the smallest range. It varies in size with males measuring from 6-12 inches (15-30 cm) and females measuring double that at 11-24 inches (28-61 cm). Adults are usually colored by a dark brown to brownish-gray with dark spots. Also there are usually small dark bumps on the carapace. In juveniles these dark bumps on the carapace are much more easily seen, as they are usually lighter in color than the adults. The carapace of the Florida softshell is covered with longitudinal rows of tubercles that resemble ridges in younger turtles but are less evident in larger turtles. In adult turtles the plastron of the shell usually extends farther than the carapace. 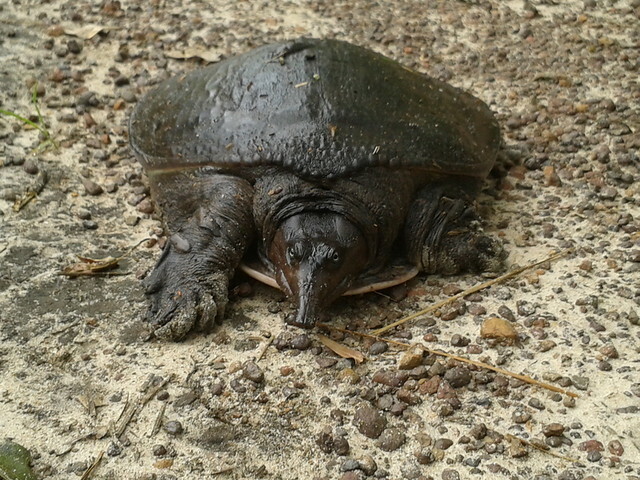 This entry was posted in Okra Paradise Farms, Reptiles, Sofshell turtle and tagged 2013-06-25, Apalone ferox, Florida softshell turtle, Francine, Georgia, Gretchen Quarterman, John S. Quarterman, Lowndes County, Okra Paradise Farms, Reptiles, Softshell turtle on June 26, 2013 by John S. Quarterman. 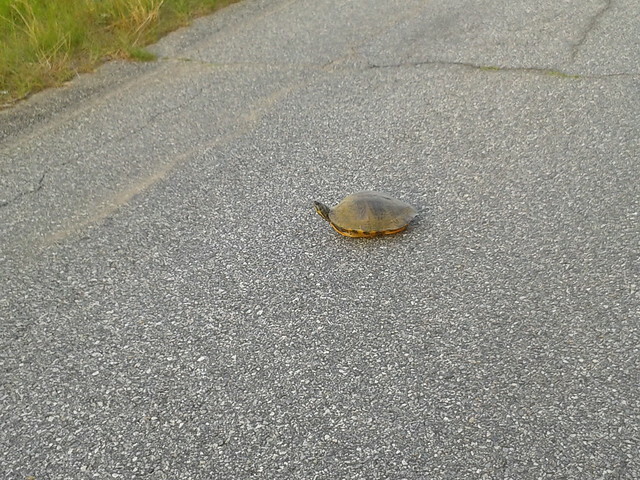 This entry was posted in Box turtle, Okra Paradise Farms, Reptiles and tagged 21 May 2013, box turtle, Georgia, Hambrick Road, John S. Quarterman, Lowndes County, Okra Paradise Farms on May 23, 2013 by John S. Quarterman. This entry was posted in Dogs, Okra Paradise Farms, Reptiles, Snakes and tagged 11 October 2012, Brown Dog, Dogs, Georgia, Gretchen Quarterman, John S. Quarterman, Lowndes County, Okra Paradise Farms, Reptiles, Snakes, Yellow Dog on October 12, 2012 by John S. Quarterman.